Here is the first project by Shannon Warren and Robert Barnes for Upasana. Upasana benefits directly from donations to the AUP Cyclone Relief fund — Please donate today. Check out long time Aurovillian Claude Arpi’s account of Cyclone Thane. Auroville —On Dec. 30 Cyclone Thane devastated southeastern India. According to the Indian government, 39 people died as a result of the cyclone and more than 20,000 people were evacuated prior to the storm. Through the devastation, a group of 20 students and faculty from The American University of Paris have remained and are now concentrating on providing disaster relief in addition to their consultation services and studies. The students are staying in Auroville, about 10 kilometers from Pondicherry, as part of the school’s annual Sustainable Development Practicum. The practicum enables students to apply knowledge acquired in the classroom to developing nonprofit organizations in the region in need of practical communications consultancy and products. The organizations that participate in this program work in a variety of social service areas including health and sanitation, the environment, labor and educational programs, legal and social rights activism and cultural heritage. Each project undertaken by the students fills a variety of needs for the organization and enables them to advance their cause and overall contribution to the community. In the aftermath of the cyclone, many of these organizations suffered great losses. These include loss of products, materials, buildings and of course their staff, who have had to work to not only rebuild their livelihoods, but their homes and personal lives as well. 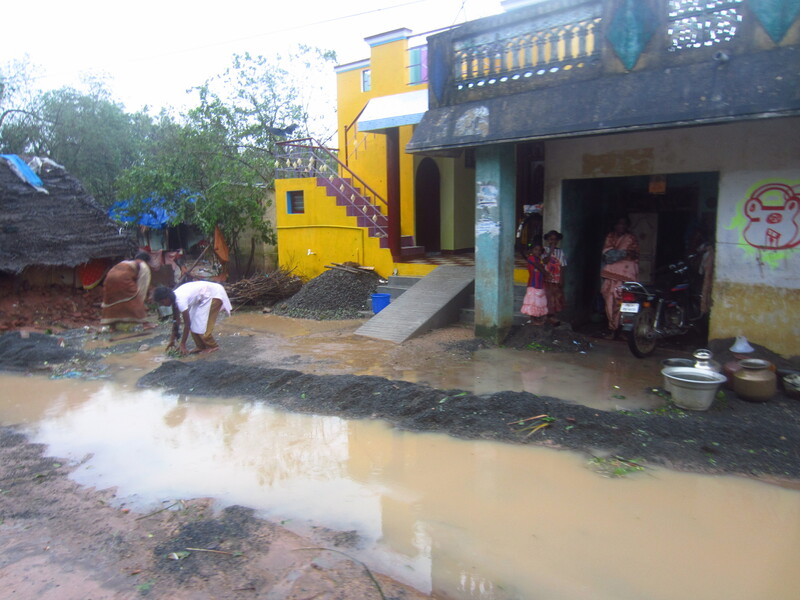 Flooding in rural communities, businesses and homes near Auroville. In direct response to these needs, the students have engaged themselves in not only building communications capacity for these organizations, but to creating awareness of the situation many of them now face and fundraising to support these organizations’ immediate needs, like purchasing new materials for schools and repairing buildings. 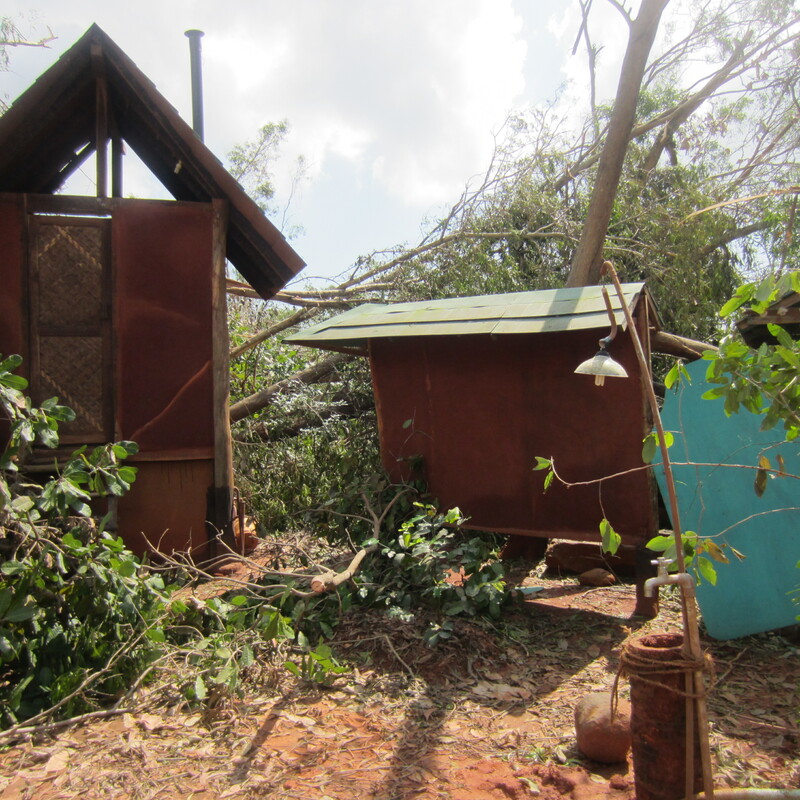 Damage to guest and resident housing structures at Evergreen Forest, a reforestation project in Auroville. You can make a donation to support these efforts here. For every donation of $50 or more, you’ll receive handcrafted natural soap from the Bamboo Life Center, an organization that provides training and work for rural communities by creating usable products made naturally from bamboo, and for donations of$100 or more you’ll receive a 100g of coffee from Marc’s Coffee, a sustainable micro-roaster from Auroville. Please keep checking this site for cyclone updates and thank you in advance for your help and interest in our efforts. Cyclone Thane hit the Auroville and Pondicherry area of India on December 30th, 2011. This short video documents American University of Paris’ Sustainable Development Practicum’s experience in the cyclone. Check back to this website for more information and updates.